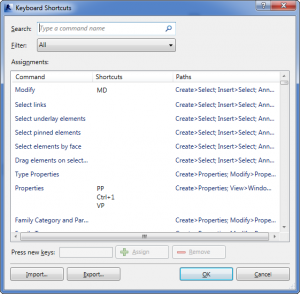 For all the work you do in Revit, there’s a keyboard shortcut that can help you do it faster. Here’s a roundup featuring some of my favorite Revit keyboard shortcuts to create and organize your model. Keep reading to learn how to create your own shortcuts. Exclusive Bonus! Click here to download a convenient PDF version of the Revit shortcut cheat sheet! You’ll also get weekly ArchSmarter updates and access to the Toolbox, a free library of time-saving Revit tools! (click to download). Shift + Arrow – Nudges the selected element 10x. SHIFT + Middle Mouse – Orbit in 3D views or pan in 2D views. Selecting an object before pressing SHIFT + Middle Mouse will cause the orbit to rotate around the selected object. ALT – Activates the keyboard designation for all the items on the interface. Might be useful if your mouse kicks the bucket before you’ve saved your file. 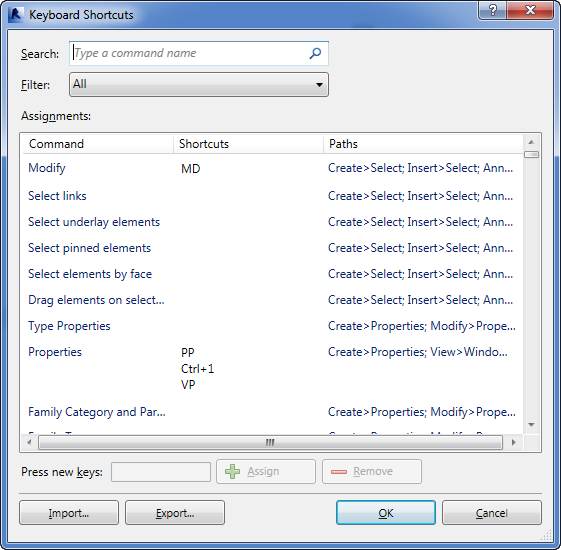 You can easily program your own Revit keyboard shortcuts. To do so, go to View > User Interface > Keyboard Shortcuts or type “KS”. This will open the Keyboard Shortcuts dialog box. All of the default keyboard shortcuts are listed. Any shortcut listed in gray is a system shortcut and cannot be changed. To add a shortcut, find the command in the “Command” column or enter the command name in the “Search” field. Once you’ve selected the command, enter the shortcut combination in the “Press new keys” text box then click the “Assign” button. You have a lot of flexibility assigning shortcuts. A single command can have multiple shortcuts. Likewise, a single shortcut can be used on multiple commands. In this case, you use the arrow keys to cycle through the commands as displayed in the status bar. Once you have the command you want, press the space bar to execute the command. Want some more suggestions? Check out this discussion on LinkedIn. Speed is king when it comes to naming your shortcuts. Consider defining your shortcuts using the same letter or letters closely located on the keyboard. JJ for Join Geometry or AA for Activate View are two good examples. You can even create three or four letter shortcuts if you need similarly named shortcuts. You could define WW for Create Wall and WWW for Worksets. This method minimizes the amount of hunting and pecking required to find your shortcuts. It lets you keep one hand on the keyboard and the other on the mouse. So how about you? How do you save time in Revit? What are your favorite shortcuts? Leave a comment below! This is very important topic that most of Revit users don’t take advantage of! I use it always. But today’s article opened my eyes to (AA & DD), activate and deactivate views as 2013 ver doesn’t use mouse double click. 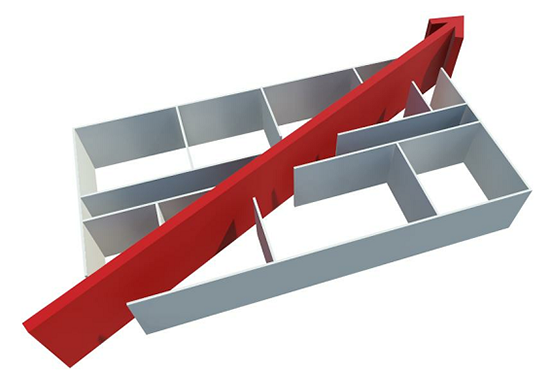 It is very appreciate for helping the Revit modular. Hi Michael. In addition to those shortcuts listed above I also use (user defined) IC and IE for ‘isolate category’ and ‘isolate elements’ – great for quickly isolating a view enabling you to edit and make changes. Then I ‘unhide’ with UH. Setting up a user defined shortcuts for trim individual (ST) and multiple (STT) is also pretty handy. Why AD haven’t done this already with factory settings is a mystery! Interesting post – I’m really fond of keyboard shortcuts. Great suggestions. I really like QQQ for close all windows. I’m going to add that to my shortcuts. Thanks! yes, it definitely has a relaxing effect ! I am amazed at how many people don’t use shortcuts. There are commands that I use all the time and if I didn’t have shortcuts for them the work would take forever. I like to tell people to look at the full list of commands available to be shortcutted and determine which ones they use the most often. Depending on your working style or your position in an office, the needs of a conceptual designer might be different from a person doing the technical drawings. It’s so great to see so many shortcut lovers. Autodesk really needs to consider a whole lot of these as OOTB. these are so important. great way to speed up productivity. i have a baseline that i have set up for our office, and ask people to print them out and keep it at their desk pinned up somewhere. Note : I make sure that there are no duplicate definitions, i.e. if CC was used for another revit command, I remove it (same method one adds shortcuts one can remove them). This is most fantastic to free monitor space if you only have a single monitor. I too like the double letter shortcuts. They’re fast! Setting F2 and F4 for the project and properties windows is a great idea. Thanks for the suggestions! “Ctrl+F4” closes current window, it is a default shortcut. I think one cannot change it. Your post should mention creating a shortcut for ‘finish group’ for when a user’s finish group toolbar goes astray / disappears from the ribbon and cannot close out from editing group(s). Hi Michael, is it possible to create a shortcut to export out a schedule? Not sure if I’m doing something wrong, but I put “xs” as the shortcut and when I open the schedule I want to export and type “xs” it puts those letters on the schedule, either in the title or the first column. And it doesn’t export. It is kind of a paint to have to go to the application menu and scroll down to reports for every schedule. Isabella – It doesn’t look like you can create a shortcut for that command. That said, I do have a macro that will batch export schedules to CSV files. It’s available for download in the ArchSmarter Toolbox. Since you’re already a subscriber, I’ll email you the link. Hi, good to see all the messages above. I was using the same letters combinations as shortcuts for about last 3 years. Good to be confirmed here, that was a good invention and some other users find this extremely improving performance. I am trying now a gaming mouse with a numeric keypad on the side to avoid moving my hand from the mouse when I need to input numbers. It needs some adjustment at the beginning, but it will help with performance significantly at the end. 1: Keeping the default shortcuts ensure that users learn the basics and if they either move between Revit versions, PC’s or in fact Offices, they have already learned the standard ones. 2: I always recommend “adding shortcuts to the fields that are empty”. This way, Users/BIM Manager can Export their “Customized” shortcuts and share with others. Then when Imported back into a different machine, there are no interruptions with the default ones when merged. These are great tips! Thanks for sharing Andrew. This is one of my favorite custom ones not included int eh list above. I have found creating custom shortcuts to be one the best ways to speed up modeling. I use the quick access toolbar below the ribbon with everything else commonly use – no more navigating the ribbon tabs!